Christmas, Crockett Style | Crockett Foundation - Tag In & Help Out! Christmas Day at Jim Crockett, Sr.’s house was a lot like most Christmas Day celebrations. It started early on Christmas morning with lots of food and gifts. Having a large, loud family was the only Christmas gift he needed. As he sat in his big leather wing back chair in the corner of the family room, he helped little ones open gifts. I am sure he was thinking about how wonderful it was that he was able to provide great gifts to his grand kids but that thought probably clouded over when he thought other families that were not as lucky. As he helped fight through ribbon and tape, he also kept an eye on his watch. It was important that Big Jim kept an eye on the time because this classic family celebration had to come to a halt no later than noon. You see the Crockett Family held at least 2 and sometimes 3 Christmas Day wrestling matches every year. These matches were the most important part of Christmas for Jim Sr. and he held everyone to a strict Christmas schedule. In his mind, the family could finish opening the gifts on another day and they could eat leftovers tomorrow because the show must go on. The show must go on because part of the proceeds from all the matches would be given to charity. The big guy knew how fortunate he and his family were and he made sure that they paid it forward. It’s not that he didn’t make his own way in life but he also knew that there were just simply some people in life that could not, for whatever reason, make ends meet. Jim did this for the most part anonymously. It wasn’t important that he get any praise for giving. It was just important to give back. 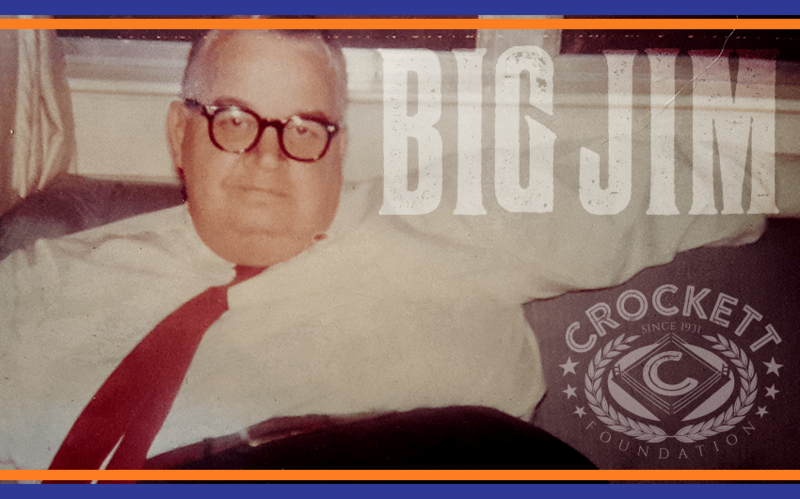 As you know, there are no more Christmas matches for the Crockett Family but Jim Crockett, Sr.’s giving spirit continues to this day in the form of the Crockett Foundation. This Christmas help us continue the Crockett Christmas tradition of giving back by making a donation or purchasing one of our items to help us help veterans with their ongoing battles here at home and helping cover the ongoing medical bills for retired active duty military dogs. We here at the Crockett Foundation strive to make Big Jim proud.